A closer look into the stand out package differences between the standard equipment of the 2019 Ram Big Horn and the Laramie. Aside from the obvious being the starting price, at first glance these two mid level Ram Light duty trucks are almost indecipherable. 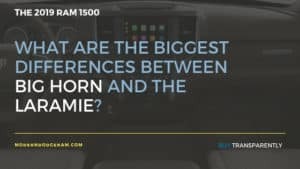 So, let’s take a deeper dive into how some of the more standout equipment varies between the Big Horn/Lone Star and the Laramie. For this illustration, we are going to assume all standard features, 4×4 drive train, and a 6’4 bed. The available standard exterior paint and trim color options are slightly different between the two models, as seen below. There are additional equipment packages that will impact the colors to choose from. Though both models come standard with the same size 18 inch wheel, the Laramie comes with an upgraded 18.0-Inch x 8.0-Inch Aluminum Base Painted Wheels, not available on the Big Horn. The Big Horn does have an available option for an upgraded 18.0-Inch x 8.0-Inch Premium Paint Cast Wheels though, instead. The next differentiator between these two very akin truck model lineup are on the interior seat trim. The Laramie comes standard with leather trimmed 40-20-20 benched searing with an optional Leather trimmed bucket seating, both not available on the Big Horn/Lone Star. Deluxe cloth bucket seats does come as an option for the Big Horne, if you prefer the bucket seating. 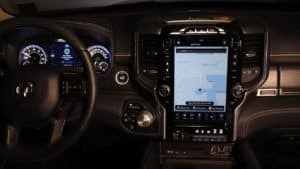 If you are one for the bigger center console stack screen, then the Laramie is your pick for the 2019 year 1500, which comes standard with the Uconnect 4 8.4 Inch Display. The Big Horn, still equipped with the Uconnect, however the Uconnect 3, comes standard with the 5 inch display. Even bigger, the Uconnect 4C NAV with the 12 Inch Display is an available option on the 2019 Ram 1500 Laramie, though not the Big Horn. Although these are minor differences, they majorly come down to what you plan to do with the truck. If this is your work vehicle and solely your work vehicle, some of the extra features may not come as important to you as keeping the MSRP down. Or, if you plan on using this as your vehicle that serves your work and personal life then some of these features may be vital for your daily commute. How would you spec out the Big Horn/Lone Star or the Laramie? Want to know how Topspeed would spec out the 2019 Ram 1500? 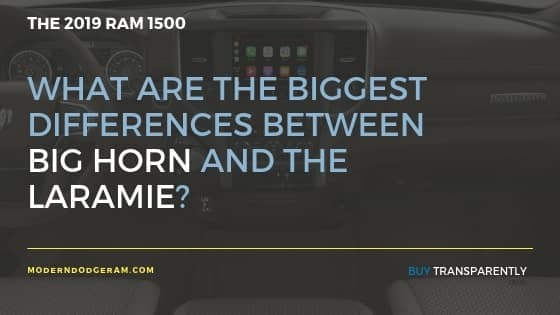 0 comment(s) so far on What are the biggest differences between the 2019 Ram 1500 Big Horn and the Laramie?